Candidate Jamie McLeod Skinner addresses an audience in Hood River. This past weekend, a group called ORD2 Indivisible led a caravan of cars from Ashland to Hood River, through much of Oregon’s Second Congressional District territory. They were drawing attention to what they see as Rep. Greg Walden’s elitism and elusiveness. Since 1999, Greg Walden has served as the U.S. Representative for this sprawling district. Although he has comfortably defeated Democrat challengers for nearly two decades, he is facing a rising tide of frustration and a dedicated opponent, Jamie McLeod Skinner. These notes are submitted by members of ORD2 Indivisible who organized and traveled with the caravan. A caravan of constituents tried to answer that question last weekend. They drove 425 miles, crossed seven counties, stopped in seven cities, and met with hundreds of people along the way, looking for their congressman. But they didn’t find him. In fact, Representative Greg Walden has been hiding from the public for 17 months. Unlike past years, when he held town halls in all 20 counties in the district, he now sneaks into town without notice and meets secretly with small, selected groups of supporters. He has his photo taken and then sneaks out of town before his other constituents know he’s been there. The “Where’s Walden? Caravan” started in two separate locations in Grants Pass and Ashland, then merged in Medford. From there, it motored on to Klamath Falls, Bend, and The Dalles, before ending in Hood River, Rep. Walden’s hometown. About 100 members of Indivisible Bend and the Vocal Seniority held a rally across the street from Walden’s office, waving signs and wearing “Where’s Walden?” t-shirts. 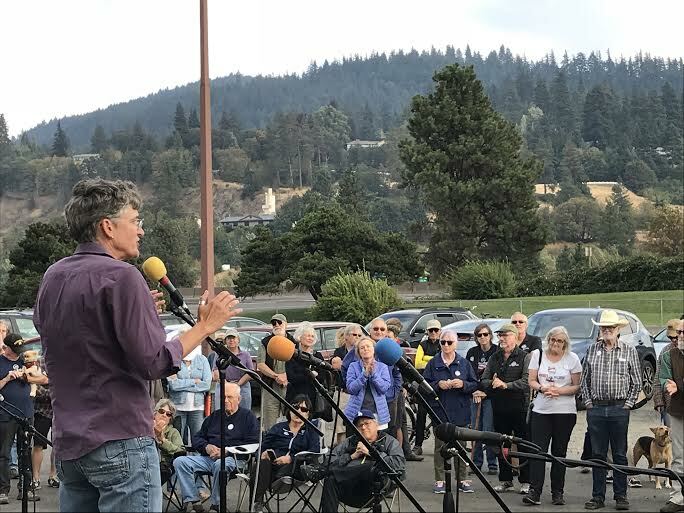 In The Dalles, about 30 members of Protect Oregon’s Progress hosted a rally, complete with an original song. In Madras, a small town in Central Oregon which typically votes conservatively, two people stood by the side of the road and waved signs as the caravan passed. And in Hood River, another 100 people from Indivisible Columbia Gorge gathered for a party in the parking lot in front of Walden’s office. Walden was invited, but didn’t show. However, his competitor, Jamie McLeod-Skinner, did, telling the crowd about logging 35,000 miles around the district in her jeep and teardrop camper trailer, and talked about what she’s learned from talking to folks about issues ranging from healthcare to fire suppression. Indivisible is a national, nonpartisan, grassroots movement formed after the 2016 election. It is dedicated to holding members of Congress accountable and resisting the Trump agenda. ORD2 Indivisible was one of the first Indivisible chapters in the nation, formed in January 2017 by Jessica Sage and Bret Levick. It currently counts over 3,000 members. District 2 includes all of Jackson County, the city of Grants Pass, and eastern Oregon. Unlike the rest of Oregon, it is the only part of the state represented by a staunch Republican. Walden votes 98.9 percent in line with Trump’s positions. In office since 1999, he Chairs the powerful House Energy and Commerce Committee.